The DJI Master Wheels 3-Axis is a wireless long-range gimbal controller featuring three wheel control modules, each providing individual control over one of the gimbal’s axes. 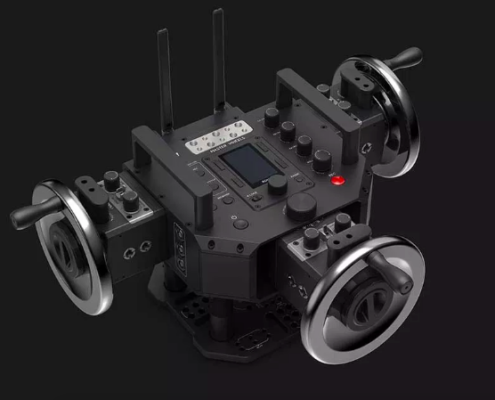 The DJI Master Wheels controller is compatible with the DJI Ronin 2 and Ronin-S, and with select third-party gimbals via an SBUS connection. It offers high-precision and low-latency wireless control over 1.8 miles of distance and wired control up to 98′ (using an optional cable). Performed movements can be saved and repeated later, allowing you to build up a library of gimbal movements. The DJI Master Wheels 3-Axis is capable of operating in temperatures as low as -4°F and it runs for up to 18 hours using the included batteries. The DJI wheel controllers use high-precision sensors and advanced control algorithms to achieve accurate and smooth camera movement. The high-resolution optical encoders are capable of detecting and communicating subtle movements, making the Master Wheels system suitable for professional film, TV, and video productions. TheDJI Master Wheels 3-Axis are made of stainless steel, providing for a classic feel and reliable operation, and the center wheel module can be adjusted to the left or right into a position closer to one of the other modules as that might be helpful in some scenarios. The wheel modules can be used attached to the Master Wheels base or detached and connected via cables, providing for more freedom in tight spaces.